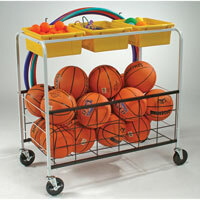 Our Specialty Carts store, move, and organize almost everything from gym equipment to school supplies. They're spacious, durable, and feature stable casters to provide a smooth ride for your valuable cargo. Buy a Specialty Cart today and keep all your key equipment right at your fingertips at a moment's notice.